Part tumbling is a method of deburring and cleaning relatively small objects. This is done by capturing the parts and media inside a rotating container. The agitation continually moves the media around all surfaces and corners of the part, smoothing them out resulting in a uniform finish. The media can be anything from specialty ceramic shapes to ball bearings to even sand. This process can be done in either a wet or dry condition. Think about the beach, the rocks there are smooth. This is due to the waves repetitively rubbing together the sand and stones which result in smooth round shapes. 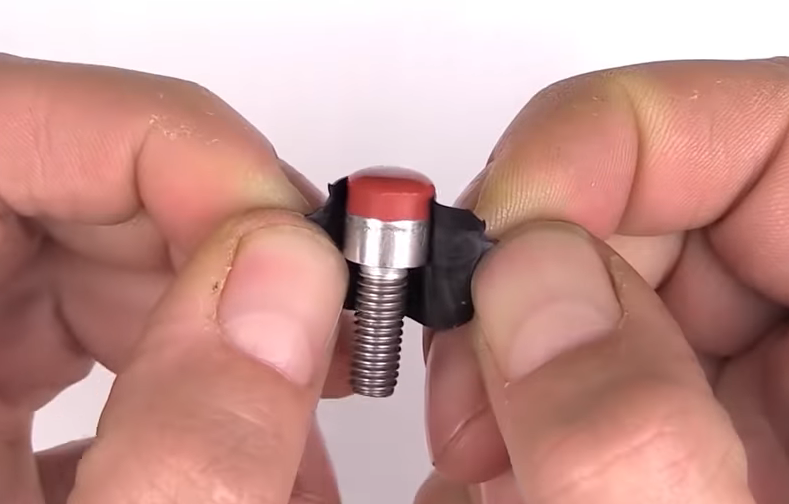 [imp22b] recently got into ammo reloading and needed a way to clean his used shell casings. The casings are brass and after a little research online, [imp22b] found that a wet tumbling process with stainless steel pins for media was a DIY proven method for this casing material. He then went on to find a commercially available tumbler to model his build after, in this case a Thumler Model B. There is certainly no need to re-invent the wheel here. As you can see in the photo, aluminum extrusion was used as the frame. Mounted to the frame are 4 pillow block bearings with shafts between each pair. A motor drives one of the bearing-mounted rods which in turn rotates a container resting on the rods. [imp22b] started with a 1/15 hp motor that he had kicking around but that wasn’t powerful enough so he did have to step up to a 1/3 hp unit. The container is made from off the shelf PVC pipe pieces and holds the media and casings along with some water. A bit of Lemon Shine and Dawn detergents are also added and help clean the parts. After a few hours of tumbling, the casings look pretty darn good. 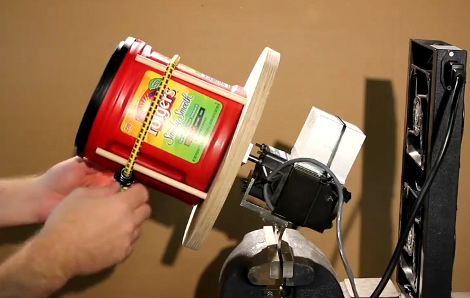 If you’re interested making your own simpler tumbler, check out this one that uses a hand drill or this one that uses a coffee can. Don’t throw out that old printer! Not that you would, but even if you’ve already scavenged it for parts, you can use the shell and the rollers to make a rock/coin/what-have-you tumbler. If your printer is part scanner, it might end up looking as cool as [th3_jungle_inv3ntor]’s. You’ll have to laser-cut your own arachnid to supervise from above, though. Somewhere between having an irreparable printer, being inspired by another tumbler, and the desire to make a mancala set for his sister-in-law, [th3_jungle_inv3ntor] was sufficiently motivated to get out his hacksaw and gut the printer. He used the main paper roller and its motor to do the tumblin’, and a smaller roller to help accommodate different jar sizes. Aside from adding those sweet blue LEDs, he wired in a toggle switch, a speed control pot, and an LM317 to govern the tumbling rate. Unfortunately, the rocks in [th3_jungle_inv3ntor]’s town are too soft and crumbly, so he can’t make that mancala set after all. But hey, (almost) free stuff tumbler. No dead printers lying around? If you have a drill and a vise, you could always make a tumbler that way, and nothing is compromised but the peaches jar. Posted in green hacks, how-toTagged lapidary, LM317, parts tumbler, printer, rock tumbler, whaddya say we turn this baby loose on some feldspar? [Jake von Slatt] of the Steampunk Workshop is at again, this time refurbishing a cheap vibratory tumbler that had died after just one project. The original Eastwood tumbler looked nice, but obviously didn’t go through much life-cycle testing at the company that designed it. Upon taking it apart, [Jake] discovered that the bearings in the motor were shot — after only a few hours of operation! Because of this he decided to start from scratch, keeping only the bowl, lid, and of course, the tumbling media. [Jake’s] redesign makes use of Volkswagen brake drums for a very heavy duty base, a custom machined ball bearing plate made out of scrap aluminum, a flexible motor coupling made by welding a heavy spring onto two shafts, some more springs to balance the bowl, and a reclaimed dryer motor. It might not look pretty, but we think it’ll last a wee bit longer than the original. He’s calling it his latest feat of post-apocalyptic engineering by using only parts on hand, and while we’d have to agree that his use of scrap material is impressive, we’d like to see him be able to power his rebuilt Bridgeport Mill off the grid when the apocalypse hits! As always, he’s made an excellent video describing the project — don’t forget to check it out after the break.